As part of the Russian Federal Space Agency’s (Roscosmos) Luna-Glob lunar exploration program, Roscosmos and the European Space Agency (ESA) are teaming up to prospect for water at the lunar south pole. The Russian Luna 27 mission will be entering its detailed design phase in 2019, with launch planned for around 2022. Upon arriving at the moon, the Russian Luna 27 lander will set itself down in the South Pole Aitken basin, on the moon’s far side. It will land with ESA’s Package for Resource Observation and in-Situ Prospecting for Exploration, Commercial exploitation and Transportation (PROSPECT) and a suite of other payloads. Once on the moon, the Luna 27 lander and instruments must survive extreme temperature swings that range between 130°C (266°F) and -240°C (-400°F). In this environment, PROSPECT will drill around 1.2 m into the ground in search of water ice and other volatiles. This will help characterize the water content of permanently shadowed regions of lunar polar craters. Not only is this an important step for scientific discovery, but it also studies how future robotic and human missions can create propellant and drinking water from these resources. 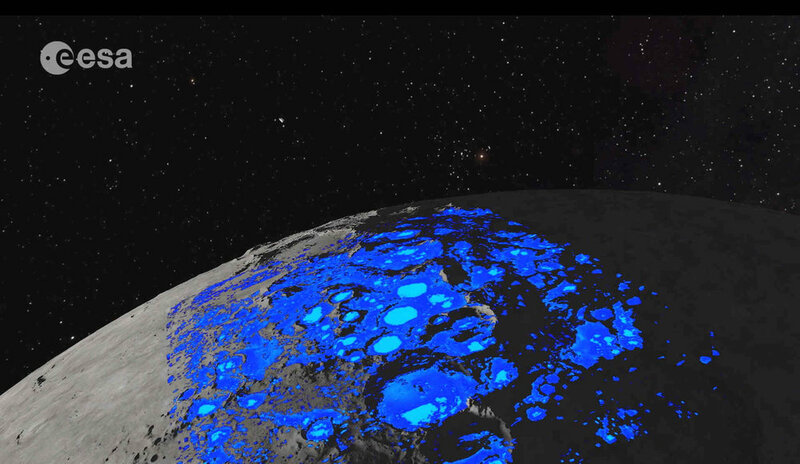 There have been many confirmations of water on the moon, and PROSPECT aboard Luna 27 will investigate these findings further. In 2009, the LCROSS mission provided concrete evidence of water ice on the moon by impacting the surface of a permanently shadowed region of the lunar south pole, detecting a water weight percentage of up to 5.6 ± 2.9% by mass. Following this, a 2018 paper that analyzed data collected from the Moon Mineralogy Mapper (M3) indicated that many locations at latitudes greater than 70 degrees contained ice concentrations as high as 30% in the upper few millimeters of the surface. These results confirm water presence, but demonstrate wide variability in water quantity. To collect ground truth and increase measurement certainty, PROSPECT’s ProSEED drill will collect samples and measure the subsurface distribution of the water-ice. The ProSPA (PROSPECT Processing and Analysis Package) subsystem will heat the samples to extract and then evaluate their volatiles. This evaluation will lead to new information on the composition of volatiles, how they got to the moon, and over what time period. 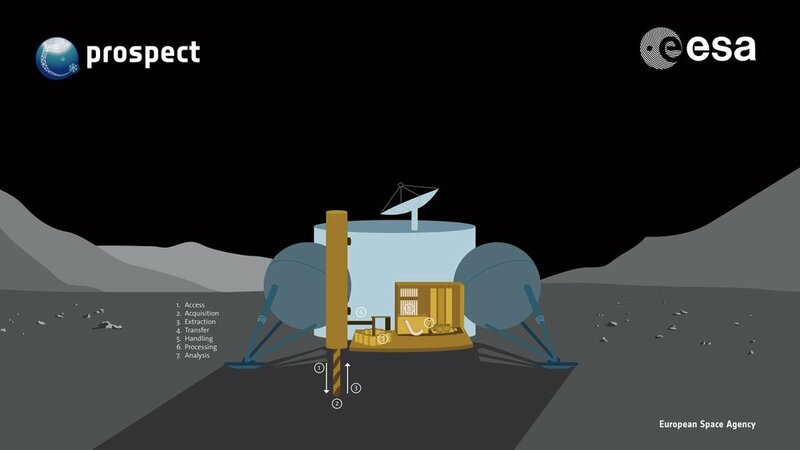 With the understanding that exploration for lunar volatiles is just beginning, the team responsible for the PROSPECT package worked to incorporate a modular design. This means that future missions will have a much easier time using various high TRL systems and subsystems that make up PROSPECT. Re-use of components designed for this mission is also welcomed, which will provide future exploration missions a proven set of risk reduced tools. Beyond the Luna 27 mission, Roscosmos aims to launch six more missions before 2026. As a part of those six, Luna 25 will launch as soon as next year and contain a "terrain-relative navigation" system demonstrator from ESA that will pilot technology to be used on Luna 27. This upcoming mission will certainly advance knowledge of resources on the Moon. In order to create a diverse and growing space resources market it is essential to have many different groups share in the effort of resource characterization. In that spirit, we wish them luck and hope to see many more countries and businesses plan similar missions over the next few years. R. Trautner, S.J. Barber, J. Carpenter, R. Fisackerly, B. Houdou, M. Leese, A. Rusconi, E. Sefton-Nash, and A. Zamboni, PROSPECT: A Novel Package for Subsurface Sample Acquisition and Analysis of Lunar Volatiles. 69th International Astronautical Congress; 2018 Oct 1 - 5; Bremen, Germany.